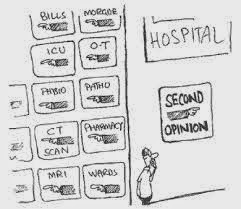 While second opinions can be quite helpful in reducing " avoidable medical care" , they come with their own set of challenges. . Patients are scared about seeking out a second opinion because they are worried that by doing so, the doctor who is treating them will get offended and may disengage himself from the treatment. Patients are scared of physicians and don't want to risk antagonizing them!